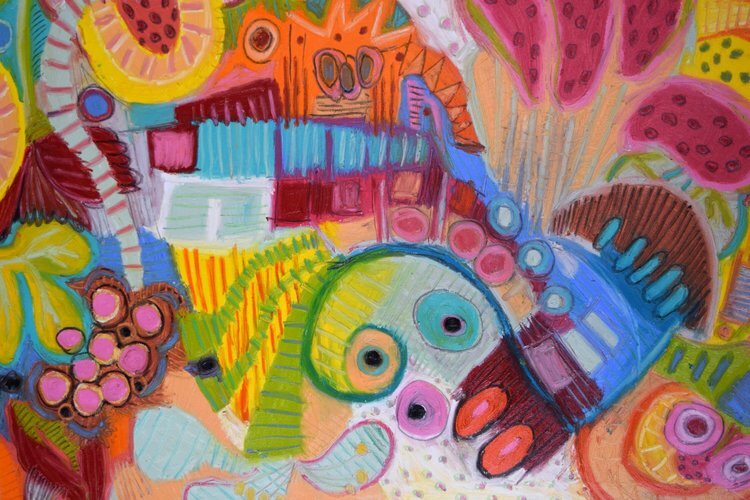 Jeff Ferst balances whimsical abstracts and vibrant figurative landscapes in a bold and balanced body of work. 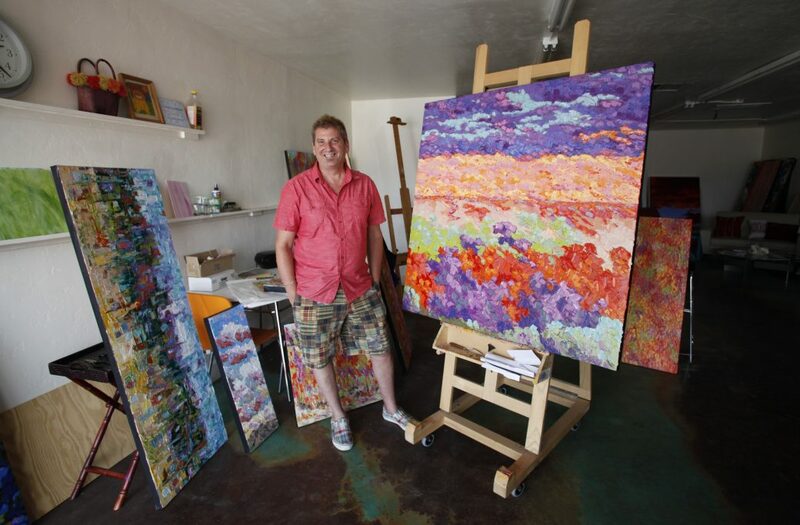 He paints his colorful stories from sunny San Miguel, where he feels energized by the plants around him and the sounds of a wall fountain and hummingbirds outside. Read on to discover how he spends his days under the sun. Good morning, Jeff! What’s the first thing you do when you wake up in the morning? I usually come downstairs to get a cup of coffee and then go outside into my garden to get some air, do a garden tour to see what flowers or growth is new, and sit and acclimate and get inspiration for the day. What energizes and triggers me each day is colour. The vibrant reds, oranges and fuchsia bracts of the bougainvillea I immediately react to. Color is my raison d’être. It’s how I interpret, communicate, react, and what feeds my passion. It runs in my veins and feeds my work. What inspires you to create every day? Here in San Miguel it is usually sunny and bright and my gardens provide an abundance of colour and life throughout the year. The ever present light, life force of the garden and abundance of joyful colour gives me inspiration for my work. There is also the undercurrent of an energy or force that is intangible at work. I say that colour is the force that drives me but there is something universal at work as well that enables me to interpret the world around me and communicate it through my painting. My studio is a building apart from my home surrounded by my garden. It has large windows facing north and east and provides great light and a view of my garden. The north window faces the secret garden which contains vines and citrus trees. The east window faces a perennial bed of birds of paradise, lilies, bougainvillea and a variety of other flowering plants. My primary easel is in the corner between the two windows so I can view my gardens while working. The studio also contains a wall of cupboards that hide all my materials out of sight. I tend to like an orderly studio. Describe the core of your technique or style. It’s about the application of colour and form and it’s about telling a story. I like to work with both brush and knife and, as you would in a conversation with someone, I too converse but with my canvas. As the conversation continues the painting evolves. Layers of colour reveal the image. Sometimes I work exclusively in oil paint, other times I add gestural elements with colour stick and oil pastels. My landscape images have many many layers of paint that create a very textural and tactile quality. All in all, I try to add a bit of whimsy to my work. My subject varies from architectural, to nature, to people and places. 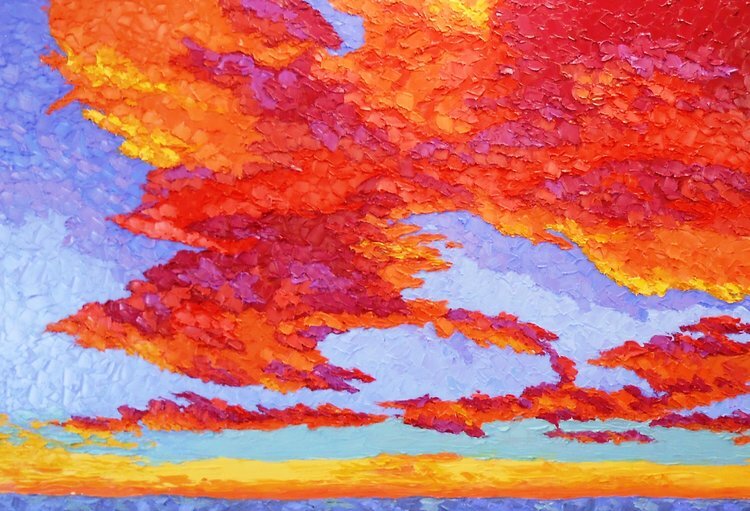 It’s landscape painting that is either interpreted abstractly or deconstructed into colorful shapes and images. Nature plays a predominant role in each painting. The paintings also have a lyrical organic quality that may appear raw and primitive. The paintings also are approachable, joyful and celebratory. Jeff Ferst ‘Symphony in the Sky,’ 2015. Oil on Canvas, 102x152cm. Alternatively, do you have any studio rituals or essentials? I actually prefer no music or added distractions. For me the sound of the wall fountain outside my studio provides the only other sound outside of nature itself. The garden sounds of bees, hummingbirds and the fountain provides the perfect backdrop for my creative soul. How do you know or decide when an artwork is finished? For me it is the end of the conversation or story. I may work on a painting continuously or I may leave it for a while and return to it. But at some point I sense the story has ended and I put my paint down and step back to review and contemplate. What do you like to do to unwind after a day’s work? After working in the studio for the day I like to either relax by “playing” in the garden – tending to my plants, cutting flowers for indoors or admiring a new blossom. I also like to go for a walk downhill to the central part of the city where there is a lot of activity, restaurants, parks full of people and a lively atmosphere. Sometimes I will meet up with friends and sometimes I will walk around and watch people and soak up the colonial charm of San Miguel. San Miguel de Allende is a small, beautiful place full of old colonial buildings, great squares and parks and an abundance of wonderful friendly people. It is a place where you are always connected to nature. Everywhere there is colour and life-filled sounds. Firecrackers sometimes wake you at dawn and are present on a regular basis. Gatherings and parades spring up on any given day. The presence of vine covered walls, jacaranda trees in spring, tropical and desert plants, flowers in window boxes wherever you look… the sights and sounds fill the senses. 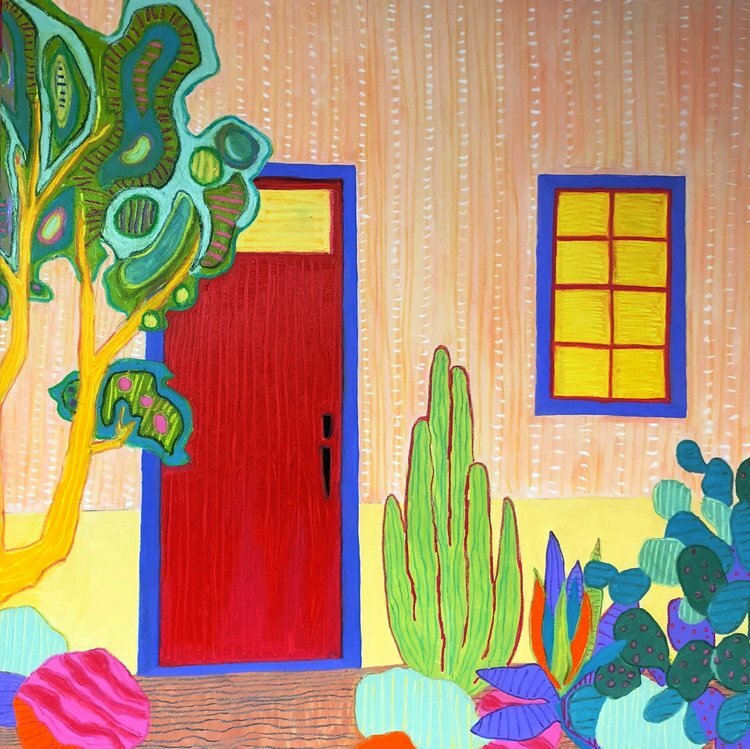 Jeff Ferst ‘Orange House,’ 2018. Oil pastel on Canvas, 122x122cm. What’s your overall favorite aspect of the creative process? That’s hard. I actually have two. One: Staring at a blank canvas and deciding what to do. The unknown leads to the opportunity to tell my story, to share my love of life and nature and to share my perspective of the world with others. Two: Hanging my work for a show or public viewing and then watching as people discover the painting and respond to it. I love to watch a young person approach one of my landscape paintings. They are first attracted by the colors, then the image and finally by the textural and tactile quality of the application of paint. Who were your inspirational artists growing up and why? In my youth I was always attracted to the impressionists like Van Gogh, Seurat and Monet. Later on I became much more enamored with the early abstract masters such as Kandinsky and Klee. It was the colour and techniques of applying that colour that attracted me and made me want to be an artist myself. I loved the way the impressionists turned colour application in painting on its head and I was intrigued and stimulated by how the early abstract artists took conventional painting and deconstructed and manipulated those elements. Jeff Ferst ‘Desert Splendours,’ 2016. Oil, Pastel on Canvas, 102x152cm. Thank you, Jeff! 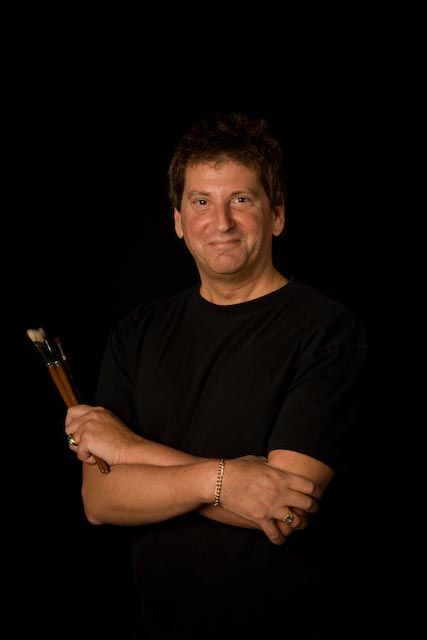 Discover his complete artist profile.